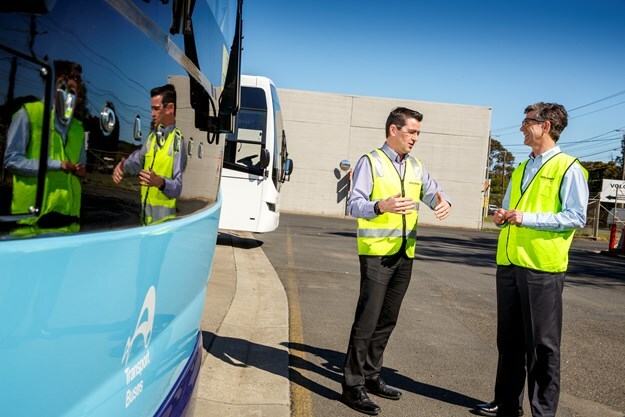 SPONSORED CONTENT: All around the world, automotive paint and coatings specialist Axalta has been there to support Australian bus-body manufacturer Volgren – and its parent company Marcopolo SA – in providing a quality bus product to its discerning customers. (L-R) Volgren supply chain manager Michael Healy and Axalta ANZ managing director Steven Brett. 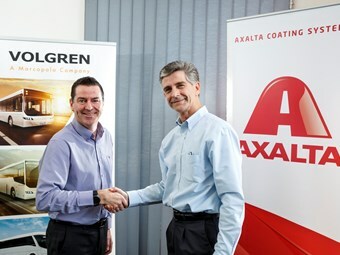 Only recently on October 18, 2018, was Axalta announced as the sole supplier of coatings to Volgren in Australia for both newly manufacturer buses and for the repair of existing buses across all its facilities in Australia, as well as throughout its global supply chain. Axalta has been working closely with Volgren and the Marcopolo Group, both locally and in export markets prior to the announcement, including in major manufacturing locations Brazil and India, where it was already the primary paint supplier. Volgren exports its low-floor city buses to Tokyo for the Tokyo Metropolitan Government, Bureau of Transport. 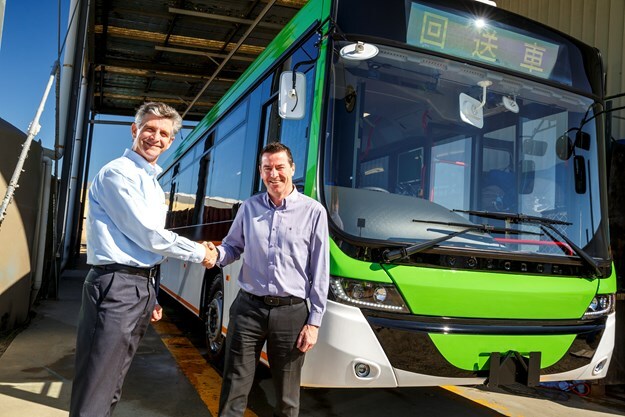 The buses were built in Dandenong, Victoria, and shipped to Tokyo in September 2018. Axalta co-ordinated the first two sample buses to be painted in Tokyo in Tokyo Metro’s required corporate colours. In addition, once the bus shipment arrived in Japan Axalta worked with Volgren on final touches to the buses prior to handover, including addressing any minor transit damage to the vehicles. Volgren’s global supply chain in China and Malaysia benefited from hands-on training conducted by local Axalta personnel, ensuring consistent product, processes and quality control, regardless of component build location. Axalta worked with Volgren to take best practice painting techniques from Australia and introduce them into their production facilities in other countries. It provided on-site technical training for painters. It was conducted by Axalta Australia training personnel and supported (with translation) by a local Axalta representative. It introduced standard operating procedures for the preparation and painting of vehicles and it implemented consistent quality control practices and methods across all sites. Michael Healy, group supply manager, Volgren Australia explained: "Axalta’s capacity to work with Volgren throughout the Australian and international supply chain has ensured Volgren buses receive consistent product, processes and quality control – regardless of where the individual component may have been manufactured." Michael Busch, key account manager, Axalta Coating Systems, added: "Axalta is extremely excited to be selected as Volgren’s paint partner. Whilst we are focused on ensuring Volgren’s customers of today receive the highest quality buses and coaches, we are equally focused on working with the Volgren team on the future – which offers new markets, new customer needs, and limitless opportunity. 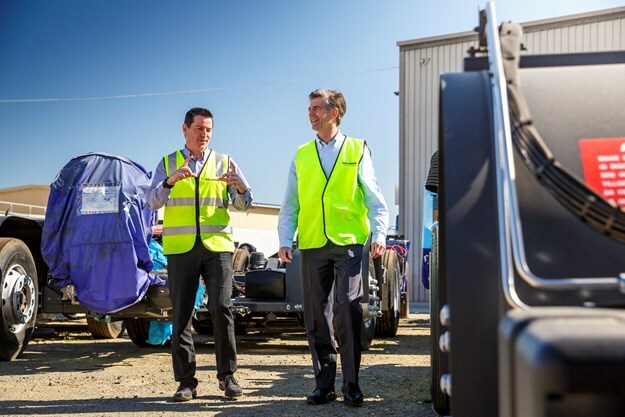 "We worked closely with Volgren at Dandenong on fine-tuning a consistent quality control process, so that the next step of replicating this in other countries went seamlessly."